Finney Funeral Services is proudly Tasmanian family owned and operated. We have been providing Tasmanian families with high-quality funeral care and practical advice on arranging funerals for over a century. With our philosophy of trust, care and support at the centre of everything we do, we offer assistance at the time of impending death, up to, and during the funeral. Over our long history, thousands of Tasmanian families have placed their trust in Finney’s. Finney Funeral Services has consistently been there for our local community to turn to in difficult times. In our provision of quality funeral care, we rely upon the support of special people from our community in our funeral directors and support staff. These people are handpicked and equipped to provide a farewell with dignity, purpose and respect. Through our investment in the funeral industry, Finney’s have the team and facilities to provide the highest-quality funeral care. For the families that will use our facilities and expertise, we will provide a positive professional experience, supporting you during a difficult time. Outstanding facilites to host all services. You have a choice of venues all in beautiful locations, ideal for a small family gathering or a large celebration of life. All our venues are fully licensed and have catering options to suit all occasions. Caring for your family at the time of need. "You have made a difficult time much easier for us." "We were most impressed by your professional services and care. Thank you so much." "Finney’s did an exceptional job, we could not have asked for more." Every life is unique, just like the way we celebrate them. We offer support at the time of impending death, up to and during the funeral. We also help you find the best way of celebrating the life of your loved one with a range of individual ideas for the funeral ceremony. Making it easier when the time comes. 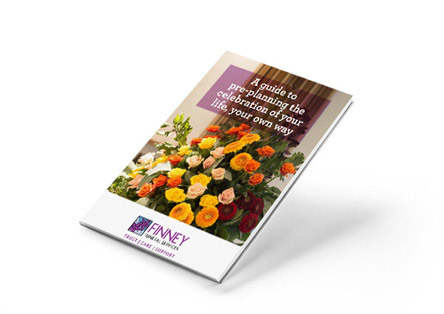 Finney Funerals offers a service that allows you to arrange and prepay for your own funeral, or the funeral of a relative or friend. A guide to pre-planning the celebration of your life, your own way. Planning ahead can ensures your wishes are respected after you’ve gone. 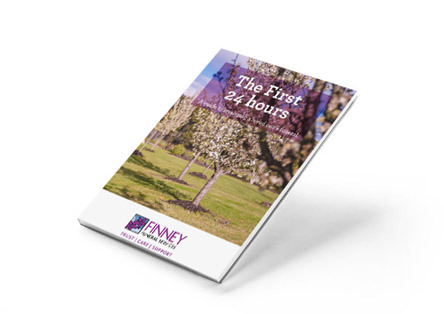 The First 24 hours: A booklet to offer support and guidance, immediately after experiencing the loss of a loved one. Contact Finney Funerals 24 hours a day, every day of the year.